The controlled generation of reactive oxygen has allowed certain organisms to grow in a multitude of harsh environments. The ability of these organisms to oxidize C-H bonds allows them to obtain carbon from otherwise inert or toxic compounds. This chemistry requires metal cofactors to activate molecular oxygen, and multiple protein-protein interactions to control the delivery of essential electrons necessary for the completion of the catalytic cycle. Toluene 4-monooxygenase (T4MO) complex from Pseudomonas mendocina KR1 is a paradigm example of such enzymes. T4MO converts toluene to a form that can be used by the cell as an energy source by entering the citric acid cycle. To perform the conversion of toluene, the T4MO hydroxylase (T4moH) is required to bind to two different proteins. First T4moH binds ferredoxin (T4moC), which delivers the necessary electrons. The conversion of toluene to p-cresol, however, cannot occur until an effector protein (T4moD) binds to T4moH. Using X-ray crystallography Justin Acheson and coworkers have uncovered how the sequential complexes allow this enzyme to perform its function. Interestingly, they found that T4moC and T4moD compete for the same region of T4moH, although their specific modes of interaction are very different. Ferredoxin binds and deliver electrons using a small interface, stabilized by complementarity of shape and electrostatic interactions, whereas the effector protein binds to much larger surface area, further exploiting hydrophobic interactions. 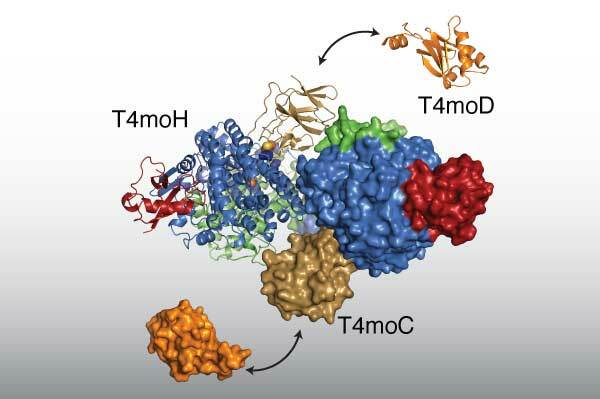 The investigators found that effector binding event causes a conformational change in T4moH that triggers the final conversion of the substrate to p-cresol with 97% regiospecificity. Ongoing work now strives to further investigate the specific details of this reaction mechanism, by trapping intermediates of O2 activation and substrate oxidation during complex formation.